The CoffeeShop Blog: CoffeeShop Vintage Chalkboard Tags 1! CoffeeShop Vintage Chalkboard Tags 1! I made these fun, digital chalkboard tags and wanted to share them with you today. These are simple pngs with transparent backgrounds so you can use them in most editing programs. Open them and add your own text. These would look adorable on websites, storyboards, Facebook covers, website headers, greeting cards, etc. I used a wonderful free-for-personal/commercial-use chalkboard texture as a background and I can't find the link anywhere... If anyone finds them please link it in my comments. I am looking for some chalkboard textures I can post here for free download that can be used however anyone likes (even commercially), and if any of you would be interested in sharing some please let me know in the comments! You will get full credit in both my blog post and download. The shapes are my own and some can be found here. The vintage design elements are from my absolutely favorite graphic designs site, The Graphics Fairy. And I used fonts from KevinandAmanda on the "ad". I will post the CoffeeShop Sun-Kissed Butter Photoshop/PSE action download in my next post. 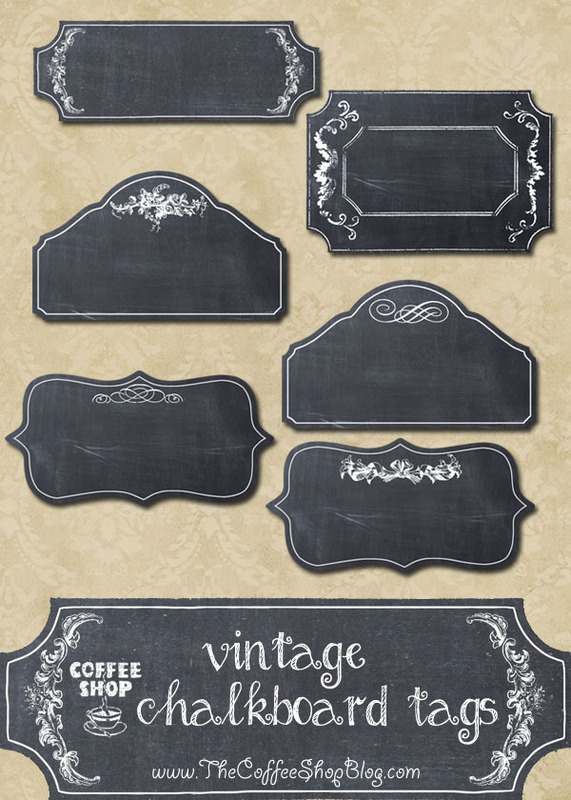 Download the free CoffeeShop Vintage Chalkboard Tags 1. You can also download them here. Will definitely use these on my sites. Thanks so much for sharing. Could you tell me the name of the font you used for "Chalkboard Tags"? Thank you for the chalkboard tags - beautiful!! These are wonderful, thanks so much. I recently downloaded free chalkboard textures from FrenchKiss. Check them out. Think maybe it was on facebook. check it out and Thanks for the inspiration. Your website is at the top of my list! I used Pea Ellie Bellie for the font on the main tag. I love the chalkboard adds that are used in the picture above, they are so creative and unique. I love coming across new decorating ideas like this. I have always wanted to build a Spiral Staircase that connects my great room to our kids play room but I never came up with an idea. I think if I made it out of wood and incorporated some of these chalkboard panels that can follow the staircase down, it would look so nice. Thanks for the great pictures!